3D printing has already made some spectacular advances, like a crowd funded machine that can print pizza. It’s not hard to imagine that we could eventually assemble any beverage we wanted in some sort of printer. All you need to do is load the “ink”: hops, water, yeast, malt. Download the blueprint, and wait about an hour for the frothy pint of whatever-you-want. Perhaps breweries would supply the recipes, and if not, homebrewers could make clones of their favorites. In the far future, technology’s reclusive tendencies (social media, video games, streaming movies) may cause people to spend more of their time in artificially constructed realities. Beverages could simply be downloaded from an ebrewery on your Google glasses. Fresh Pilsner Urquell could be a blink away. Instantaneous erandalling vooms into the beer (this is more Cat in the Hat pseudo-science). This thought experiment is in the near future. Granted, downloading beer from an ebrewery seems fantastical. Over the next decade, however, Occulus Rifts and 3D printers will become part of our homes and businesses. What lies ahead of even this inconceivable technology? The Kardashev scale allows us to see ourselves and our place on the technological spectrum. This scale is a numerical value between zero and three that describes a civilization’s level of technology, based on how much energy they could use at any given moment. Today we rank 0.7 on this scale, a humble nudge that we have a ways to go. A ranking of one would allow us to control planetary-level energies, which is a lot of energy (4×10^16 watts). Type III civilizations could bend the very fabric of the cosmos to their will, possibly changing reality in ways we can’t even fathom. What could you possibly want to do with that kind of energy? Why not accelerate the aging of beer inside whiskey barrels? 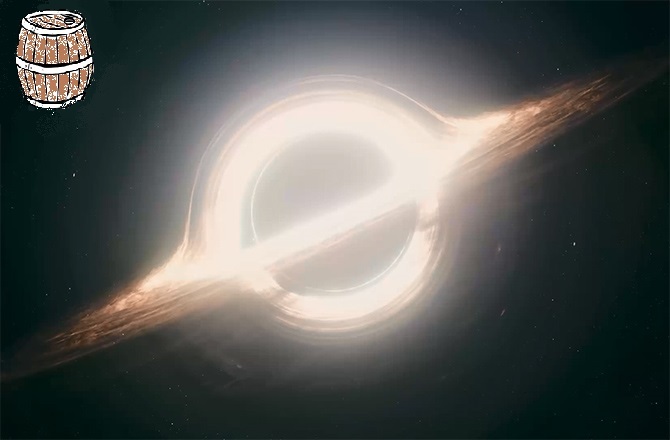 Some have speculated that a Type III civilization might decide to inhabit an object near an giant black hole’s event horizon. Ultra massive black holes are so large, the tidal forces would be tolerable, but their time dilation qualities would be exceptional. The universe could pass away during your lifetime if you lived near enough to the singularity. Of course, you’d never see it, since information cannot travel past the event horizon. Unless of course, you have a naked singularity, but now lets get our heads out of the gutter. If you lived on a planet near the event horizon of a super massive black hole, you could space-cannon-shoot your whiskey barrels far away into space at relativistic speeds, away from the large gravity well that bends time in your favor. After they loop around and land safely back on your home world, you could enjoy the contents of an ale that aged longer for the beer than you did (because relativity). Whiskey makers would take note, spiriting their booze away on return flights that would allow them to try hundred year old whiskeys, thousand year old whiskeys. Billion year old whiskies? If the cask and booze held together, was hermetically sealed, and the protons didn’t decay, why not? We presently have Beer Barreled Bourbons, as well as beer made with barley from space. Lets extrapolate that curve and imagine “Darth Lord Double Imperial Stout”, aged for twenty years in billion-year old Elijah Craig barrels, then racked onto perpetual motioned cherries in a Solera vat, filtered over platinum shards from a nearby supernova. The platinum shards are a close substitute for beachwood aging. Want to brew a beer now but drink it fresh a hundred years from now? Simply jettison imperial stout-filled Dark Horse Rye barrels into space at relativistic speeds towards the nearest convenient wormhole, ala Interstellar, popping out conveniently near a super massive black hole. Circle the black hole once, then return through the wormhole and back home. Your wrinkly hand will gnarl with pleasure as it grabs the frosty mug of this ancient yet fresh brew. These tasks would require a lot of energy, but I imagine it will be like going to the Google Fiber store. They showcase their technology by streaming a dozen movies at once to utilize their insane bandwidth. Imagine driving to the Google double-paned Glasses store, or the space-cannon barrel shooting service. Perhaps they would showcase their downloadable beer or billion-year old whiskey. These possibilities make me excited for the future, and will probably increase the human races’ chances of trying some Pappy van Winkle 23 year. Pappy van Winkle 10^23 year! !